We’ve been trying something new in the kitchen lately – adding some vegetarian dishes to the dinner rotation. And the craziest part of this menu modification is that it was my husband’s idea [gasp!]. The meat eater of all meat eaters actually suggested that we add some vegetarian meals to the line up (thank you Netflix and the documentary Cowspiracy). While I love meat, I like to mix it up and so I saw this as an opportunity to try out some new recipes. Yay! So let me introduce you to Mushroom Stroganoff. This dish is ahh-mazing. I’ve always been a stroganoff fan, but mine had always had beef. I thought it was the beef that contributed most of the flavor, but I was wrong. This dish is full of flavor and hearty as well. My kiddos loved it too – Brogan actually said it was one of his favorite dinners ever! I’ll take it! Hope you enjoy! 1.) In large skillet over medium-high heat, melt butter and sauté onion and garlic until translucent (about 5 mins). 2.) Add mushrooms, salt and pepper. 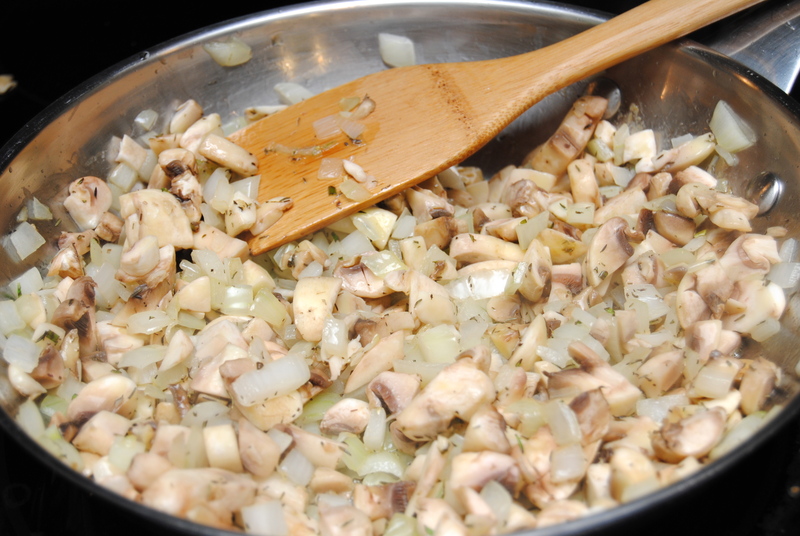 Sauté until mushrooms are soft and browned (about 8 mins). Stir in tomato paste and cook a few minutes longer, continually stirring. 3.) Add flour and stir, scrapping the bottom of the pan as you do. Cook for 1 to 2 minutes. Add white wine to deglaze. Continue stirring and scrapping the bottom. Once wine is mostly evaporated, add vegetable broth, Worcestershire (or soy) sauce, mustard and thyme. Bring to a boil, reduce heat to low and simmer for about 5 minutes. 4.) Remove sauce from heat and stir in sour cream. Stir in cooked pasta and serve! I finally decided to start making some new dishes this week and so I’m excited to share another Pinterest win! 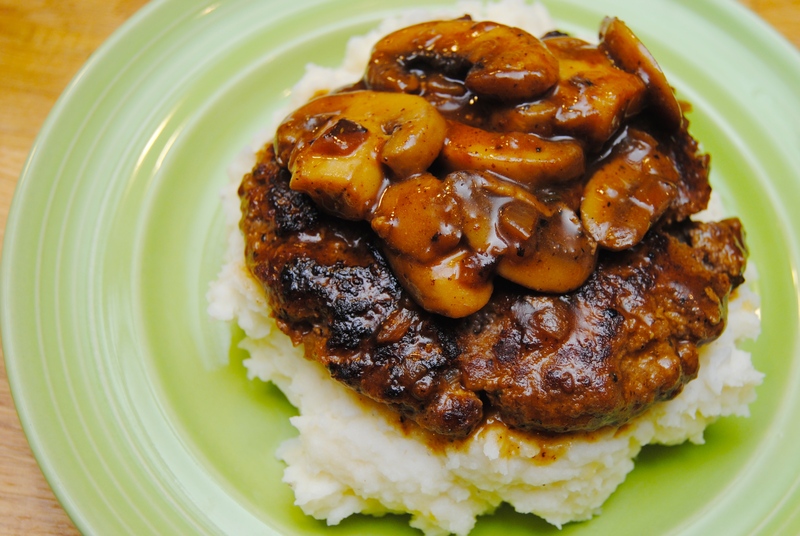 Fresh on being infatuated with my recent Salisbury Steak Meatballs, when I saw this recipe with the mushroom gravy, I couldn’t wait to try it. This dish is pure comfort food. I served it over mashed potatoes and it was plate-licking good. Hope you enjoy! 1.) Add all salisbury steak ingredients (except butter) in a large bowl. Using your hands, mix all ingredients well. Form into 6 patties and set aside. 2.) In an electric skillet or large saute pan, heat 2 tbsp butter over medium-high heat. 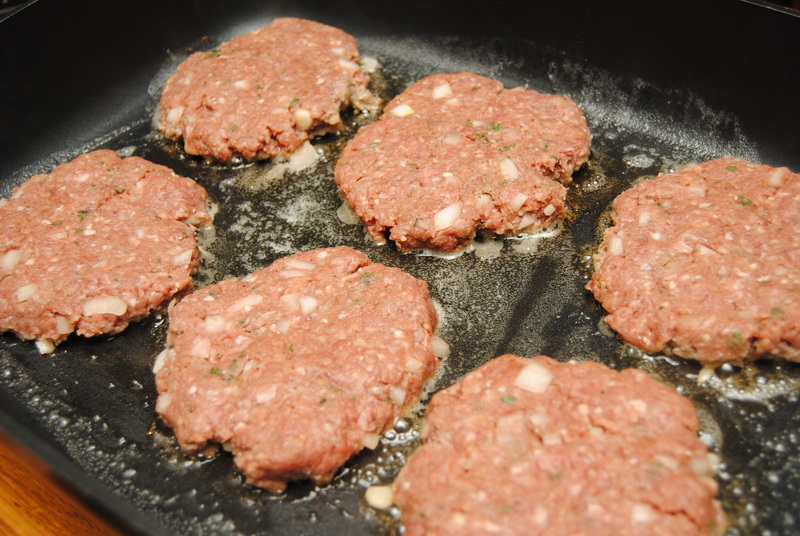 Add patties and sauté for 4 to 5 minutes on each side. Remove from pan and place on a plate. 3.) In the skillet you cooked the meat in, add 1 tbsp butter, mushrooms, shallots and thyme and sauté for 8 to 10 minutes over medium-high heat. Sprinkle flour over mushrooms and stir to combine. Add in beef broth and stir well. Bring to simmer to allow sauce to thicken. Taste and add salt and pepper as needed. 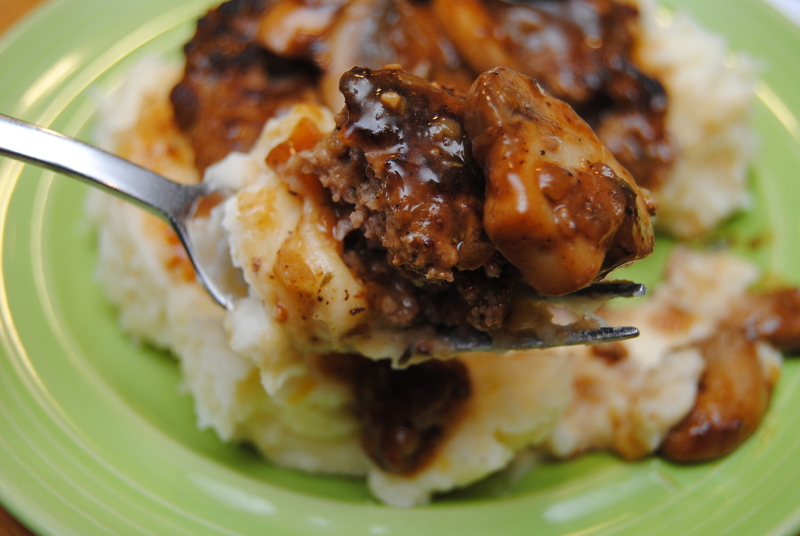 Place salisbury steak patties back in the skillet and cover them with gravy. Serve over mashed potatoes. 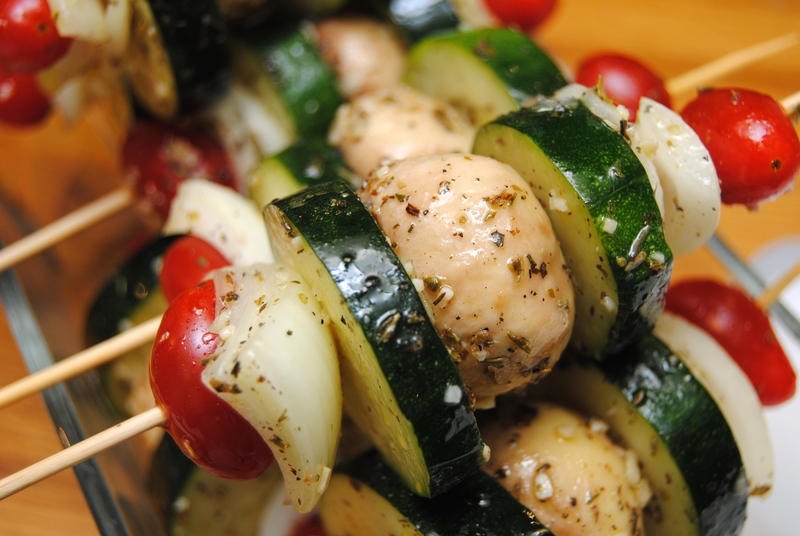 Kabobs – another summer staple. 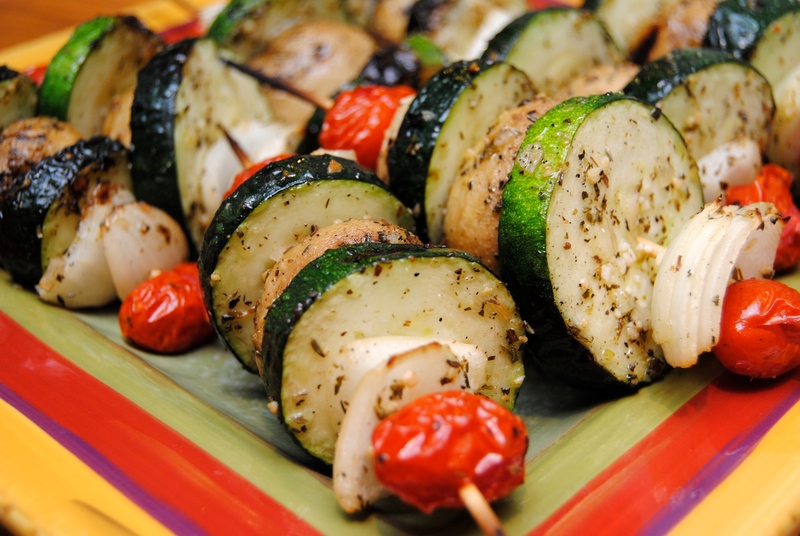 I grill all year round, but love to make veggie kabobs in the summer when the zucchini is fresh and plentiful. 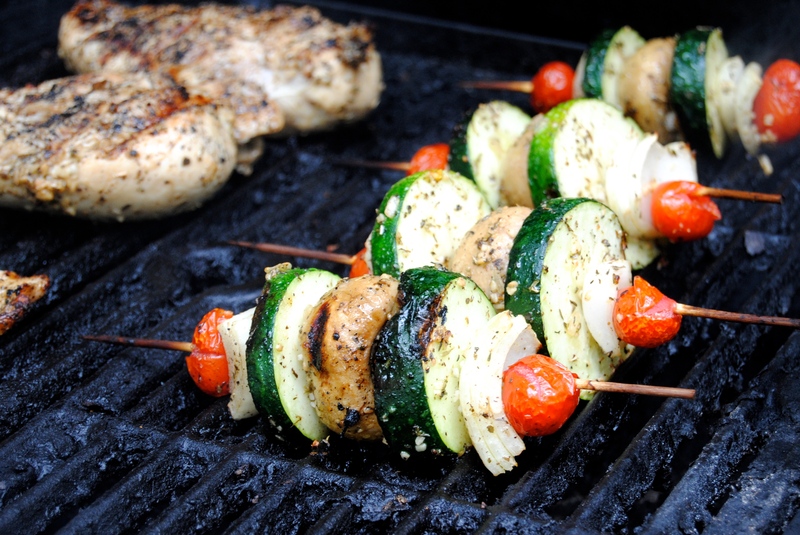 I had been grilling kabobs for years but always felt like they were under-seasoned… when it occurred to me that I should marinate the veggies before I put them on the skewer! Problem solved – perfect kabobs. 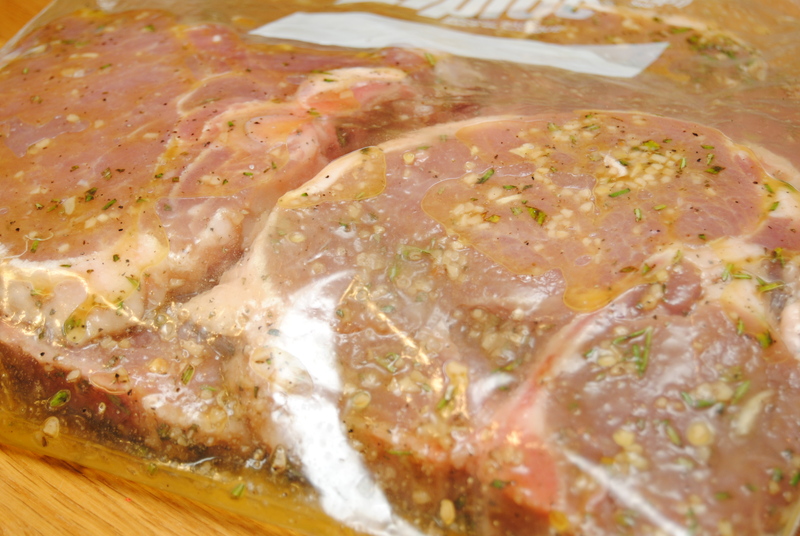 The marinade I like the most is this one – a mix of garlic, herbs and dried minced onion. Full of flavor! One of my favorite things about this marinade and process is that the mushrooms get a whole lot of the garlic and herbs stuck in the little nook where the stem once was and it is so, so good. 1.) In a gallon Ziploc bag, combine olive oil, garlic, minced onion, salt, thyme, oregano, basil and pepper. Close bag and shake to combine well. 2.) Add veggies to marinade and let sit for 20 to 30 minutes. 3.) 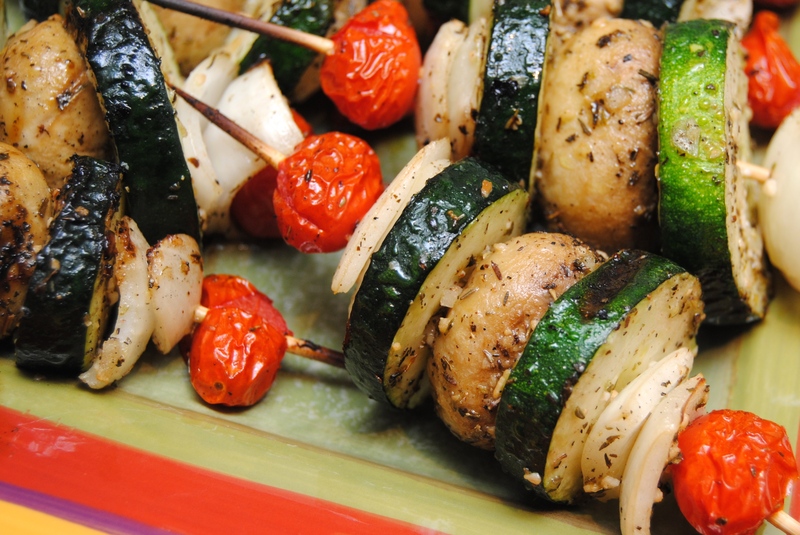 Place veggies on skewer – tomato, onion, zucchini, mushroom, zucchini, onion, tomato. 4.) Cook on a hot grill for 8 to 10 minutes. Turn them over and grill for another 5 to 7 minutes. Last year my husband and I tired to grow herbs. Tried. We had no luck with cilantro, basil, parsley or thyme, but the rosemary has hung in there! I have not given up hope that (one day) I will have a green thumb, but I realized that growing things that require being fed every day is like having another child or animal, and momma ain’t go time for that. Rosemary, apparently, will survive on rain alone. So, since rosemary is my only free herb, I experiment with it occasionally. 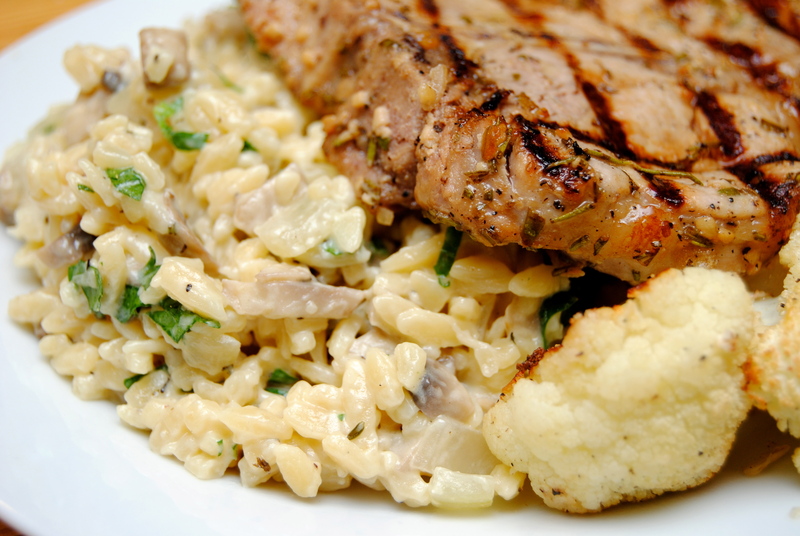 One pairing that has turned out really yummy with my rosemary is pork chops. 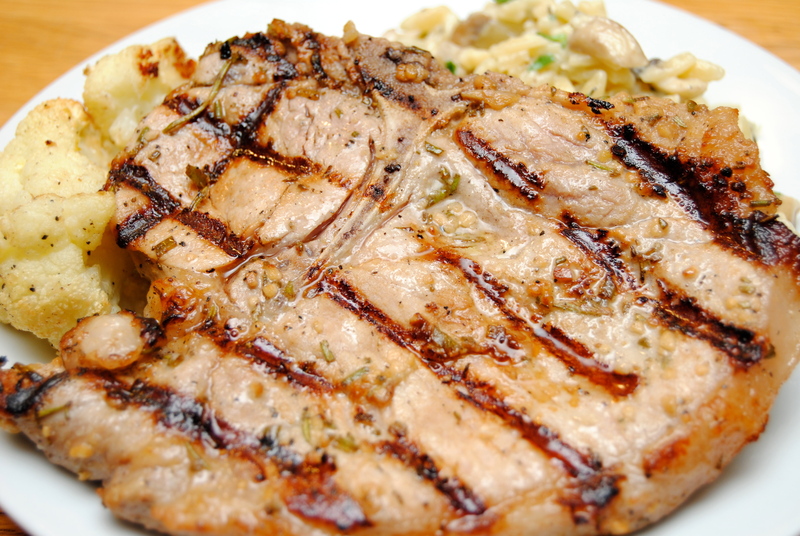 Throw a little rosemary, garlic and olive oil together on some bone-in pork chops for the grill – delish! On the topic of pork chops, I’ve found that bone-in chops are soooo much better than their boneless friends. You get that gem of a tenderloin, the meat seems juicier and more tender, and it doesn’t have the strange texture that the boneless sometimes does when it is only cooked to medium. I digress. So I built my Sunday dinner around rosemary and the meal turned out great. I also decided to make another pot of orzo. Once I stumble across an easy and tasty way of cooking something, I replicate the heck out of it (why reinvent the wheel??). This time I married it with mushrooms, rosemary and thyme; same grain as a couple of nights ago, but totally different taste. We ate this with lemon and parmesan roasted cauliflower and it was a dinner that the whole family loved. 1.) Combine all ingredients in a gallon Ziploc bag. Marinate for 30 minutes to overnight. 2.) Grill for 4 to 5 minutes on each side. 1.) Cook orzo according to directions on box. Drain, toss with 2 tbsp olive oil and set aside. 2.) Heat 2 tbsp olive oil and butter in a skillet and sauté onion and garlic until onion is translucent. Add mushrooms, rosemary and thyme. 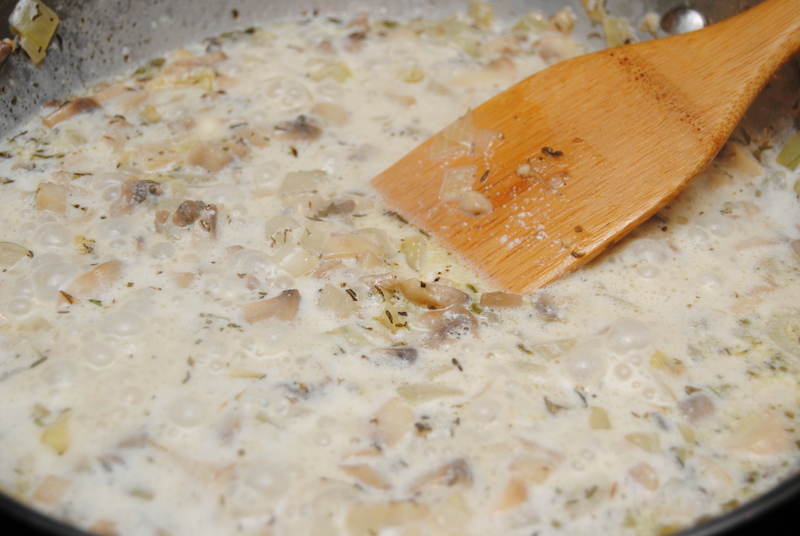 Cook until mushrooms are soft, about 3 minutes. Add milk and sour cream, and cook until heated through. 3.) 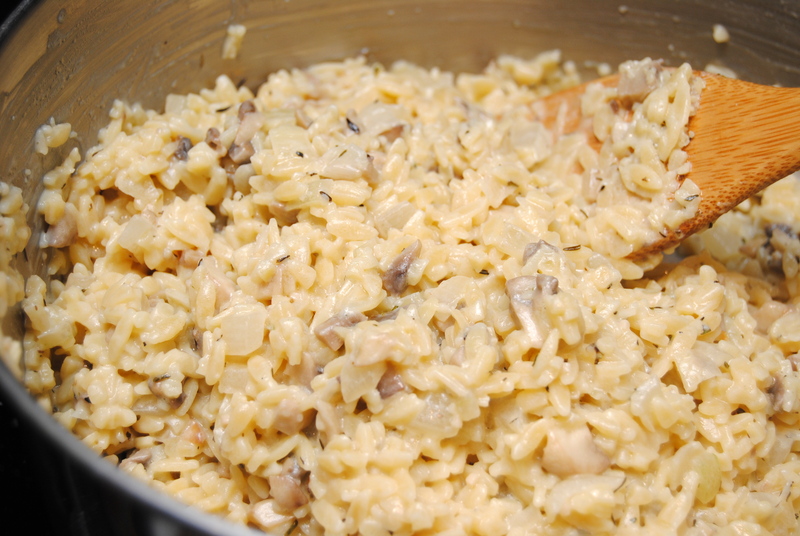 Pour mushroom sauce over orzo. Add parmesan cheese and parsley. Stir well until completely incorporated. Salt and pepper to taste. 1.) Preheat oven to 425 degrees. 2.) Cut florets out of cauliflower head, and then cut florets into halves or quarters (depending on the size of the floret). 3.) In a gallon Ziploc bag, add all ingredients and toss until cauliflower is evenly coated. 4.) 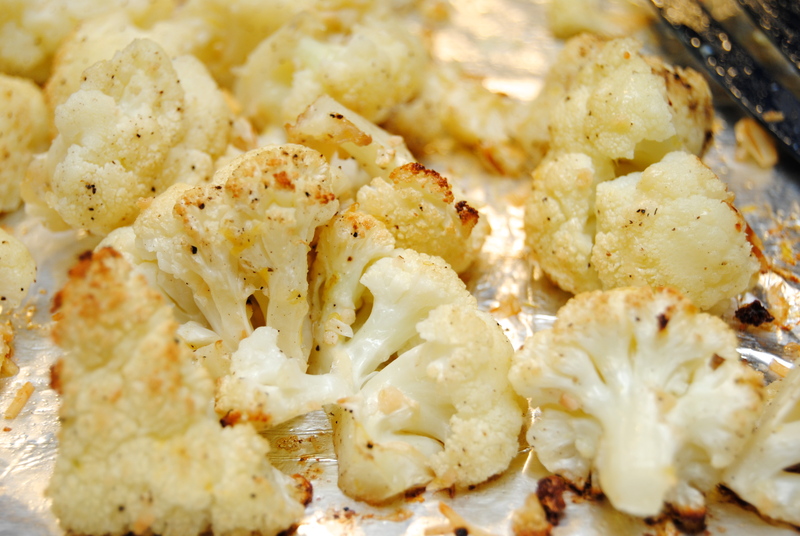 Pour cauliflower onto a baking sheet and arrange into a single layer. 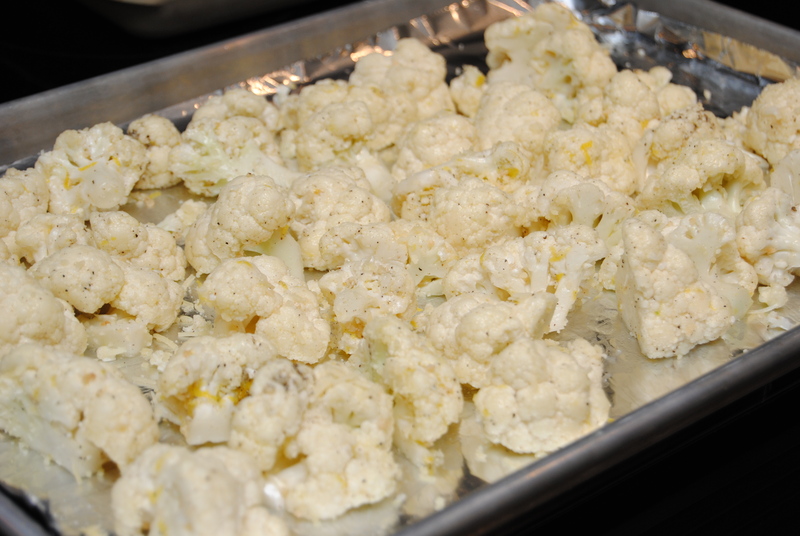 Turn individual cauliflower pieces so that they are laying flat side down on the baking sheet. Bake for 15 to 20 minutes, or until edges/bottoms are golden brown. I love goat cheese. Like, love it. Will eat anything with it. I’ve started buying it in bulk at Costco so that whenever I get the urge, I can cook with it. 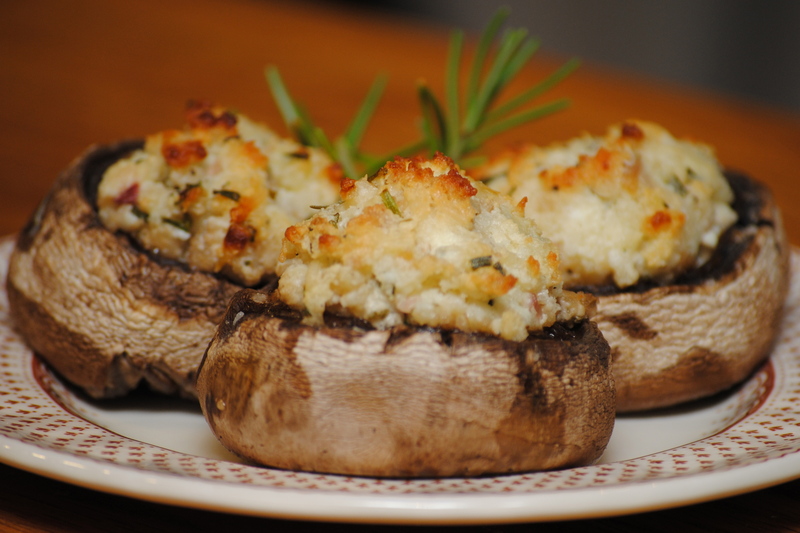 Well I got the urge last night and decided to make use of some mushrooms and herbs I had around to create this yummy appetizer. No Pinterest inspiration here – I tried to channel my inner chef and come up with something tasty all on my own! And it was my personal chef (Blake) approved. Hope y’all enjoy! 2.) 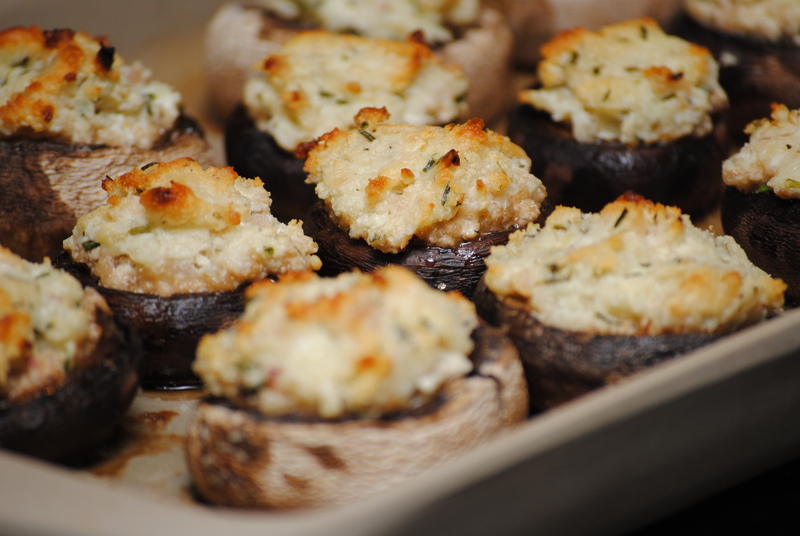 Place mushrooms on baking dish. Drizzle with olive oil and sprinkle with kosher salt. 3.) In a nonstick skillet, melt butter and add shallots, garlic, rosemary and thyme. Saute until shallots are translucent, about 3 to 4 minutes. Add in breadcrumbs and mix well. 4.) In a bowl, mix goat cheese, parmesan, chives, salt and breadcrumb mixture. Spoon into mushrooms. 5.) Bake for 20 minutes.